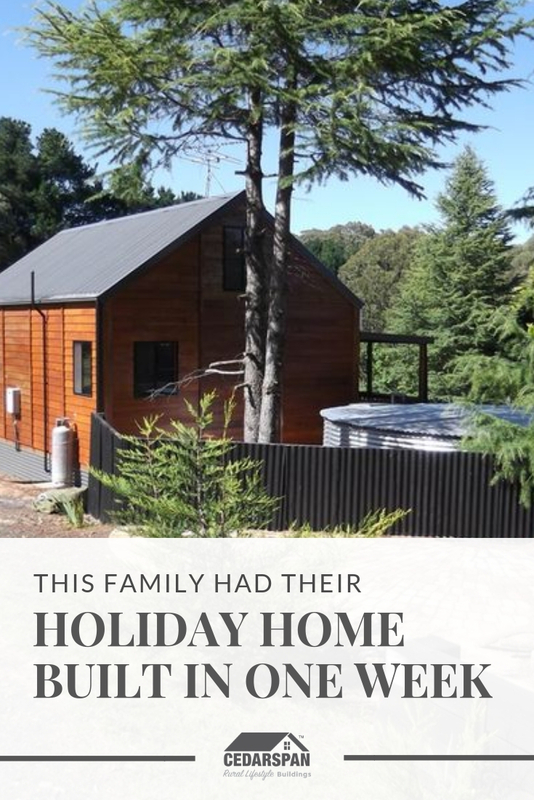 A holiday home built in under a week! Approximately 6 hours’ drive north of Sydney, in a cozy little corner of New South Wales, you’ll find a fascinating place called Hanging Rock. The Holiday Home was a traditional Cedar Loft Cabin. After being factory-constructed in panels, the cabin was driven to site and construction began. Cedarspan’s prefab construction method means that large trucks and cranes are not required, and the piered floor system means no concrete slab is required. Once the panels arrive onsite, it only takes one week for the entire building to be assembled. With Cedarspan’s Quick Installation, the Building was complete in under a week. Click here to watch us build a cabin! A beautiful outlook. This Cedarspan Loft Cottage in Hanging Rock, NSW was built in under a week. The large verandah creates the perfect space for a cuppa or two. A great escape from the hustle & bustle of city life. You will notice there are no cross braces required inside, making the room seem more spacious. This special construction style is unique to Cedarspan, proving popular with Australians over the last 40+ years. Inside, the walls are lined with EasyCraft wall lining – a quick and tidy alternative to traditional plasterboard. By incorporating natural timbers, white walls and muted colours, the owners have turned this holiday home into a cozy, relaxing retreat. Beautiful natural patterns of the wooden floor separate the kitchen area from the living area. This flooring (available with all Cedarspan buildings) has been stained to protect against spills. A quick & easy DIY project. The owners have added corrugated steel siding to prevent animals and snakes from getting under the home. The piered floor that the home sits on means that no levelling or concrete slabs were required. Photos courtesty of Ray White Tamworth. View the original listing here. Cedarspan is a 3rd-generation family business that have been building cabins across Australia for over 40 years. We’d love to show you just how fast & easy it is to add a barn, cabin or cottage to your property. Click here to download prices, or give us a call on 1300 635 966 to get your project underway. Know someone who would love this? Send them the image below!